William Eden Meals II, 80, of Tallahassee, Florida, died November 1, 2016 at his home. A native of Long Beach, California, he grew up in Pasadena, California. He attended South Pasadena High School and graduated from there in 1954. He spent his early adulthood years working summers on ranches in Nevada. He earned a degree in Animal Husbandry from Cal Poly in San Luis Obispo, California and a degree in Business Administration from Menlo Business College in Menlo Park. 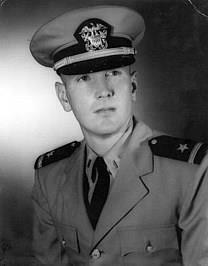 He served in the US Navy Reserve and was deployed in 1962 during the Cuban Missile Crisis and on numerous West-Pac Cruises on the AKA Washburn and the Reserve Destroyer USS Evans. He retired from the Navy as a Lt Commander. In 1970 Bill was Assistant Personnel Director for the Department of Agriculture for the State of Florida until his retirement in 1996. Upon retirement he built a vacation home and spent summers in Elko, Nevada and served as a long-time member and treasurer for the Friends of NRA and was an excellent marksman. Bill is survived by his wife 'Totsy' Cavanaugh Meals; daughter Kimberly Meals and son-in-law Marcus Strickland of Tallahassee; son Charles Meals of Lake Havasu City, Arizona; two grandchildren, Cole Meals and Sydney Nicole Meals; and a very beloved brother-in-law, Carl Cavanaugh and his wife Donna.